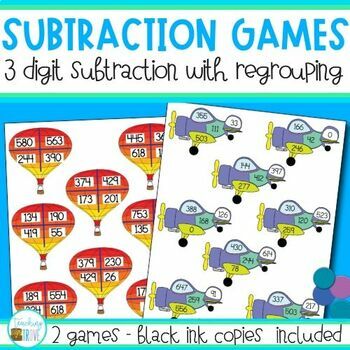 Three digit subtraction games give your students the valuable practice they need to consiolidate 3 digit subtraction with regrouping. 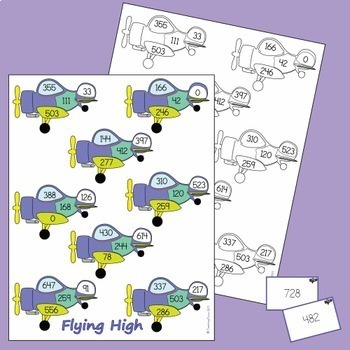 More motivating than a worksheet, your class will love this hands on approach to consolidating three digit subtraction. In these subtraction games for 2 players, players must draw two cards and subtract the smaller number from the larger. If the answer is on the picture they cover it with a counter. The self correcting element of the game ensures that students get the answer correct or find their mistake if they've made one. 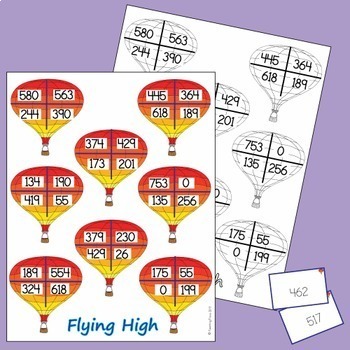 Just print the game in color or black ink only and place it in your math centers. Students can play in small groups independently or with minimal adult support. Become a follower and take advantage of my Early Bird Specials, freebies and product launches. Look for the green star near the top of any page within my store and click it to become a follower. You will then receive customized email updates about this store. Would you like to receive TPT credit to use on future purchases? Just go to your My Purchases page (you may need to login). Beside each purchase you'll see a Provide Feedback button. Simply click it and you will be taken to a page where you can give a quick rating and leave a short comment for the product. I value your feedback greatly as it helps me determine which products are most valuable for your classroom so I can create more for you.